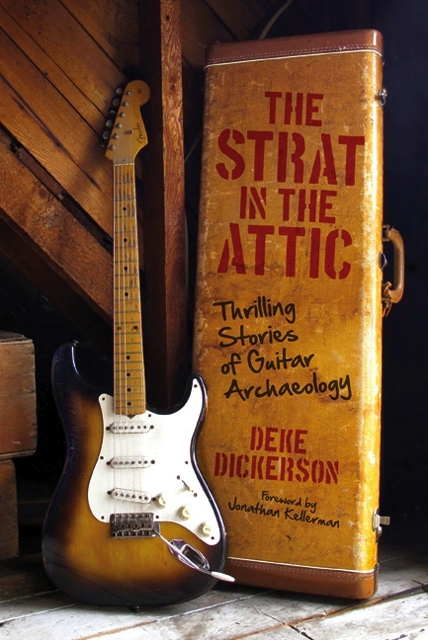 The Strat in the Attic – Buy This Book! Guitar sleuth and music-history detective Deke Dickerson tells the true tales of 50 thrilling rare guitar finds that will make guitarists green with envy. A golden Fender Stratocaster hidden away in an attic for 30 years. A sunburst Gibson Les Paul worth $100,000. Jimi Hendrix’s Strat burned by the guitarist during a concert—and then mysteriously lost for decades. The mint Fender Broadcaster forgotten under a bed in a neighbor’s house. The 1960s Rickenbacker bought for $50 at a garage sale! These days, classic vintage guitars can bring Ferrari and Porsche prices. Baby boomers who wish they’d been rock ’n’ roll stars have shot the market into the stratosphere for classic models. As with automobiles, finding that classic guitar stashed away beneath a bed, in a closet, hidden away in an attic, or in the dusty corner of a guitar shop is the Holy Grail.